We used a Nook Color to read Axel the Truck: Rocky Road. It was free, which is always a good start. The writing is not terribly sophisticated( “Axel is a red truck. 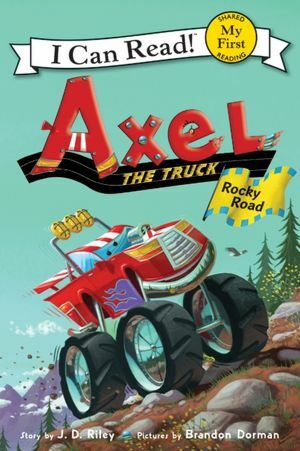 Axel has big, big wheels.”), but there are sound effects, onomatopoeia, repetition and lots of action. And, of course, it is a story about a monster truck, which lends a lot of credence to its literary merit in the eyes of my 2.25 year old. The reader is given the Read to Me/Read it Myself option, but there isn’t any interactivity. The narrator isn’t annoying; I daresay he was almost pleasant to listen to. Reading this book to ourselves felt just like reading a paper book: the screen displays two pages at a time,; you turn those pages with a swipe; you read the text, look at the picture and move on. It’s the same content; it just arrives in a different vehicle. Ba doom boom. In other news, Axl Rose isn’t looking so hot these days. Posted on December 30, 2011, in eBook, eReader, Review. Bookmark the permalink. Leave a comment.